Motherhood has proven to be a roller coaster of enormous proportions for me. The highs are so high and the lows are sooooo low. As the days and months go by, the challenges have begun to ease slightly but are usually replaced quickly by another test of patience and sanity. It does not help that I find it hard to let go of my control freak ways and OCD tendencies. These qualities have always been the roots of my success but are now hindrances as the parent of a happy but tempermental 9 month old. Luckily, I had the opportunity to let my creative juices flow lately, despite limited baby-free time. My obstetrician requested a cake for several obstetricians who were retiring this year from BC Women's Hospital and how could I say "no" to the man that delivered my child??? And since I am currently still in a post-partum state of mind, this cake and its subject matter were quite apropos. 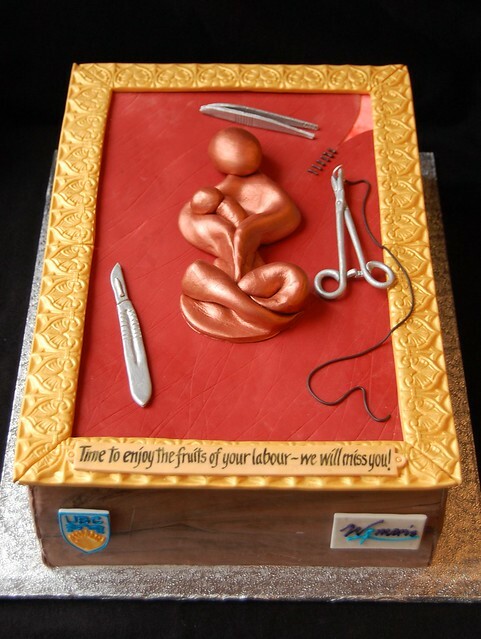 He wanted the design to be similar to Dr. Seal's retirement cake but with an obstetrical twist. Secretly, I was hoping for something silly like a giant uterus but he had something classier in mind! 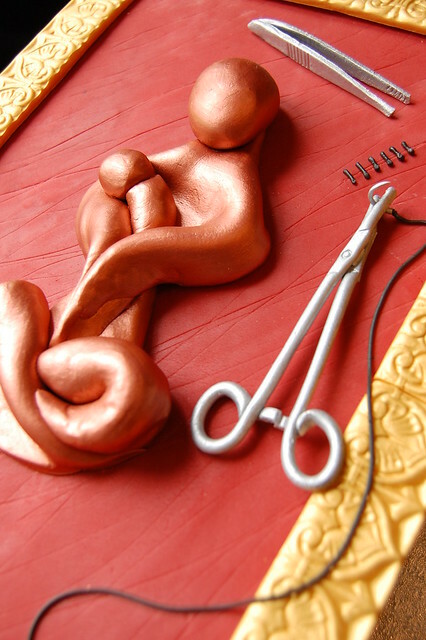 And so, I decided to frame a sculpture of a stylized mother and child, with surgical tools sewing up the background, which was metaphorical uterine smooth muscle. It is hard to see in the photos, but texture was added to the rusty red background to emulate spindle shaped smooth muscle cells. Leftover fondant was used to make the figure by folding a thick layer of fondant and later painting it in edible copper dust. The cake measured 10" x 15" x 4" and featured pistachio, black currant and vanilla flavours, identical to Margaret's birthday cake. Considering that I have not lifted a spatula for months, I was very pleased with the final outcome, both from a design perspective and an organizational perspective because finding the time to construct it was the biggest challenge of all! Posted by Charmaine at 8:41 p.m.
Glad to see you are back blogging! I cannot imagine how much having a child woud change your world! March 6, 2012 at 4:12 a.m. I remember how much having a child changes your world, I also remember the lows. I cannot understand how the professional bakers manage to continue on with their baking and a newborn (as many that I follow seem to do!) I sometimes barely function with an 11 and 13 year old and then only if they pitch in and make supper - lol! Every once in a while I check back to see if you have posted anything and I know that the frequency will increase again with time. Remember when you are with your little one that none of the minute details actually matter in the end. Enjoy every second, they grow so fast! March 6, 2012 at 7:42 p.m.
April 4, 2012 at 3:51 p.m.
October 24, 2012 at 7:06 a.m.